It could be that this is a super common trick and I just managed to never hear about it, but I've been having a lot of fun in arenas recently, playing with using traps as a sort of mental interrupt on healers (and warlocks). It tends to work pretty well, even with the travel time for trap launcher, you can get one off when they're trying for a big heal, and 90% of the time they move, interrupting their own cast. After noticing a couple times that this was working with freezing trap, I figured, why waste my freezing trap. So I started trying with Snake Trap, and it worked just as well. I'm not sure if the different color glow in the trap is just not known to most non-hunters, or if there's just not enough time to look, and they're moving as soon as the see the trap anyway. Whatever the reason, it makes me a little giddy each time I manage to interrupt a cast with a snake trap. For SV, that makes a total of 4 interupts with glyphed Explosive Trap, Freezing Trap, the Snake Trap trick and Counter Shot, all on 24 sec CDs. For MM you have slightly longer CDs but that glorious Silencing Shot more than makes up for it. If you have all your traps off CD, and the other damage dealer on your team is ready to burst, you could easily keep a healer interupted for 6-10 seconds. The Snake Trap fun ends soon, I'm afraid, as there's little chance of seeing snake trap in WoD, but for now it's a blast. "When the raid leader says 'Stop DPS', what that means is, 'DPS.'" I used to love watching Kripparrian's videos, back when he was making WoW hunter videos. But this one, from was probably my favorite. And you know, all the advice still applies! What really made this one great is all of the people who took it seriously and got really upset about it. Go check out some of the older youtube comments on it for a good time. If you're interested in some of his other videos, he followed this up with a non-scumbag video of how to do top dps. I've got a couple listed in the Tools tab up above. He's no longer playing WoW (though I'm hoping he'll come back for a while in WoD), but he does a lot of hearthstone videos these days, if that's your thing. Fellow hunters, this week I had the pleasure of talking with the hunter who really put raid pet-tanking on the Azerothian map, long time Dues Payer of the largest group of drunken dwarves you’ll ever find, and retired author on the most successful WoW blog ever, Arth. Let’s jump right in, Arth, welcome. ARTH: Thanks for asking me to be featured on the site. I like a lot of what I’ve seen from Thrill of the Wild so far, and hope your audience keeps growing. And to those hoping for Frostheim, my apologies. Hopefully the 2nd most uncommonly good-looking blogger from the Warcraft Hunters Union is a good consolation prize. DELIRIUM: Your last project at the WHU (other than that cruel, cruel April Fool’s day joke) was the Hunter Project, which, for those who don’t know, was a gigantic compilation of suggestions and ideas for the hunter class going forward, all of which stayed within Blizzards design philosophy. Going forward in WoD, I’m getting fairly excited about the Camo buff, especially in regards to making Survival more Survivable, as was called out in the Hunter Project. Seeing the changes to hunters going into Warlords, are there any points where you feel like the Devs really listened to that project, or at least gave it some consideration? ARTH: I think there’s a PC answer here (politically correct, not personal computer), and a reality-based answer. The PC answer is that the devs DID read it (I have Ghostcrawler’s word), considered its points, and there’s some evidence that they took it into account with things like spec differentiation and the Survival changes you mentioned. The real answer is that they probably had a ton of variables in mind that we could never account for, and any perceived overlap between their actual changes and our requests is coincidental. 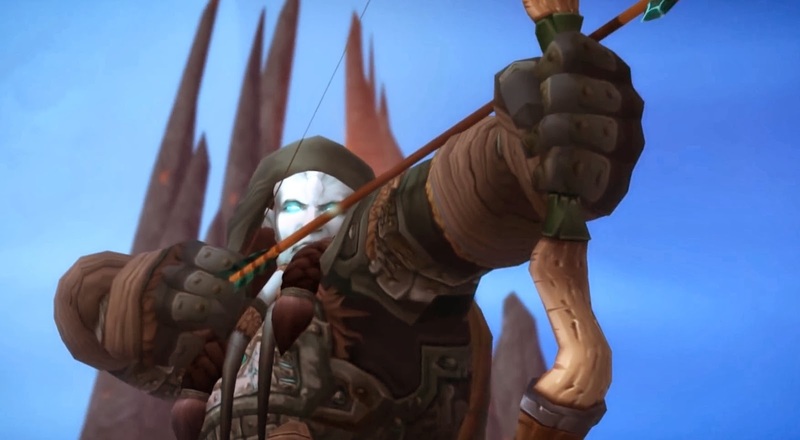 The Hunter Project was always a bit of a longshot, but even as it was going on, I was firmly of the mind that even if we only changed one small thing about the class in WoD, that it would be a success. So I think the jury’s still out on its influence. But as a collective effort that said “here’s what we can agree on, and here it is presented respectfully,” I think the community can be proud of it regardless. DELIRIUM: In general, any changes you’re really excited about, or anything that you are somewhat dreading? ARTH: Once you take a step back and stop playing, even briefly, the individual changes stop being momentous. Despite tracking hunter changes for years, I was never too caught up in them. I always enjoyed my hunter, and always will. The base mechanics of the class are appealing enough that the rest is just window dressing. That’s also a kind way of saying I haven’t been following changes too closely. While I’m away from the game, I’m AWAY. Once I come back in WoD, I’ll do a lot more catching up. DELIRIUM: Getting back to your time at the WHU, as I understand, you began as a guest guide-writer, specifically on the topic of Pet Tanking. I’ve seen a tale of your first time as a pet main-tank, what would you say was your most memorable experience pet-tanking? ARTH: An impossible (but good) question. The most fearful was undoubtedly when I tanked Patchwerk in what was my first real raid-tanking test. The most fun was probably in the all-hunter raids we did where we’d have 3-4 different pet tanks, and were able to come up with some insanely awesome and unique strategies to conquer bosses that 25 DPSers shouldn’t have been able to tackle. Sindragosa has to be at the top, though, because it was the fight that put pet tanking on the map. At about 100K views on Youtube (easily the best I’ve managed), and features on WoW Insider and several smaller sites, it was the first fight where people could watch a hunter tank a boss that, in many cases, their guild was still struggling with. Anything can be tanked eventually, but when maybe only 25% of the raiding guilds on a given server had downed her, and a damn hunter was doing what two normal tanks often couldn’t….well, it was a good feeling. DELIRIUM: I was talking about the possibility of pet tanking with my current raid group, and one of our support classes, who generally tanks, was saying he didn’t feel like a pet controlled by AI should be able to do what a human controlled character can do; though, I imagine he wasn’t too familiar with the work that went into pet tanking. How would you describe the difference between the work that goes into playing a traditional tank and playing a pet tank? ARTH: I’d stress that you want to start small. It is different, as you mention, which is why your first pet tanking foray shouldn’t be a progression fight or even raid boss on farm. I started with non-heroic dungeons, and would acquire experience (RL experience, not in-game) with holding threat, switching targets, and balancing healing and damage by offering to tank low-level dungeons for friends who were leveling. My Wrath-geared toon started tanking with BC dungeons, and I slowly worked my way up. So the only way to convince some raid groups that you’ll be able to tank a raid boss is to first tank dungeons, heroics, etc. Earning your stripes also has the benefit of giving you low-stress practice. So there may still be hope if you haven’t yet tanked a raid boss. On your guildmate’s comment, a pet CAN’T do all the things a regular tank can do, so he need not feel threatened by hunters (well, he can, but that’s because we’re just better overall). But we can come close in many aspects. Properly managed, in MoP pets have been able to maintain higher aggro than all but full tank specs and faceroll dps who lack all awareness. But these days, it’s hard to find fights where melee swings from bosses don’t wreck pets beyond any healer’s ability to deal with (which is why I always enjoyed Disc. Priests, whose reductions and shields gave pets a better cushion, whereas their smaller health pools made things harder for traditional healers). And even aggro is problematic with boss mechanics that occasionally won’t recognize pets, spotty implementation of Growl, etc. We’ve always had an uphill battle. But, for example, a hunter should be able to admirably tank any heroic dungeon currently, so we’ve not lost all of our tanking potency. The work isn’t necessarily different though. You optimize your play-style and adopt the role like anything else. 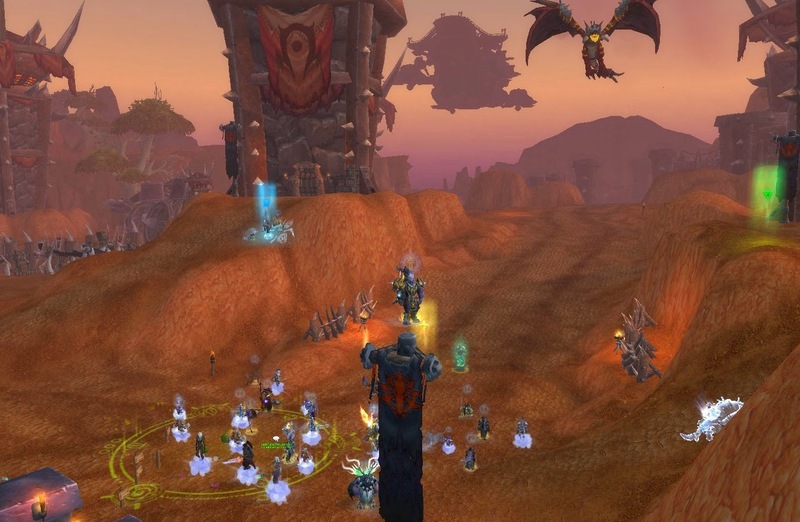 I enjoyed tanking because it was also an introduction to leading groups, which paid off for me as I led raid teams in Wrath and Cata (and all-hunter runs in Wrath, Cata, and MoP). DELIRIUM: With the change in tanking gameplay, from threat generation to active damage mitigation, do you see much of a future for raid pet-tanking? ARTH: It’s hard to say. We thought Wrath was the last call for such shenanigans, but hunters collectively tanked way more bosses in Cata. MoP has been tougher sledding, and it looks like WoD will be as well, but a lot will depend on balancing issues with raid bosses and pet mechanics that we don’t have enough info on currently. 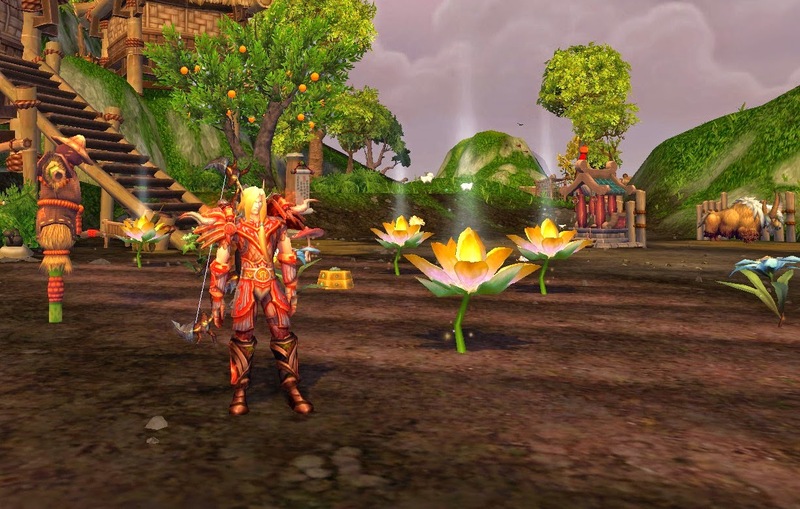 DELIRIUM: Finally, you’ve been in retirement for several months now, as we approach (hopefully) the WoD Beta, and start to get a lot more news, and a lot more information to start playing with, do you have any desire to get back into the WoW blogging game? Or have you not looked back at all, just enjoying it without the responsibilities? ARTH: Blogging, no. That was Frostheim’s thing. I enjoyed the WHU, but running it was always going to be a temporary gig for me. I do miss the podcast. That was epic fun. I don’t regret ending it at episode 200 (a horribly paced and chaotic episode, but Soooo much fun), but I miss everyone that was involved with it. Darkbrew, Alisaunder, Euripides, Frostheim, all of our awesome guests and co-hosts. Probably my one regret is that I wasn’t involved with the podcast until its final 40 episodes or so, and that we didn’t have the collective time or will to keep it going. But it was also an immovable weekly obligation, and as I played less I felt less and less qualified to talk to a bunch of knowledgeable hunters about the game. So the timing was right. It was never about the responsibility though, but the time, which usually ends up being the case for many people. I like being the one that has responsibility. But I don’t do “casual” well in WoW. I want to min/max, organize all-hunter raid runs for world firsts and glory, hunt down potential pet tanking achievements, and pimp out my main and shoot for server firsts (which I sadly never achieved, though in Wrath my guild had numerous top 10s on a competitive server). And while I was in college, and in the 2-3 years after as I floated between part-time jobs, and didn’t have a robust social life, that was all easy to do. But now, seven years or so after I started playing, with numerous personal and professional projects on my plate (among other things), that kind of commitment just isn’t in the cards. I’m hoping I still have the time in WoD to take my main seriously. And maybe my alt if I’m lucky. The only other toon I’ve ever leveled is my Disc. Priest, which is the only spec – not class, but spec – outside of the hunter that I enjoy (everything else is so terrible…how do people play other classes?!). But for me to even have a shot at maintaining a WoW account, I had to drop the WHU community stuff, especially once Frostheim hung up his gun for the last time. DELIRIUM: Thanks so much for taking the time to do this, I know I for one have really appreciated what you've added to the Hunter Community (way back whenever, I spent a long time going over those pet-tanking guides, dreaming of finding a guild who’d be willing to try it), and I'm certain there are many others who feel the same way. ARTH: Thank you! I was part of what we dubbed the 2nd generation of hunter bloggers. BRK and a few other oldies were generation 1. And with the WHU’s massive traffic at its peak and many community projects, Frostheim was undoubtedly the leader of generation 2. It’s encouraging to see several promising blogs (and a podcast!) taking the place of the WHU and HPP (Hunting Party Podcast). Generation 3 is in good hands, and Thrill of the Wild will be on my list of regular visits. One quick plug before I go: The WHU isn’t updating anymore, although I do update the final-article Resource Guide to remain current, and it’s quite comprehensive. But if there are hunters out there that want to go back and see the history of the hunter community, a LOT of it is catalogued in the WHU’s penultimate article on its history (link below). 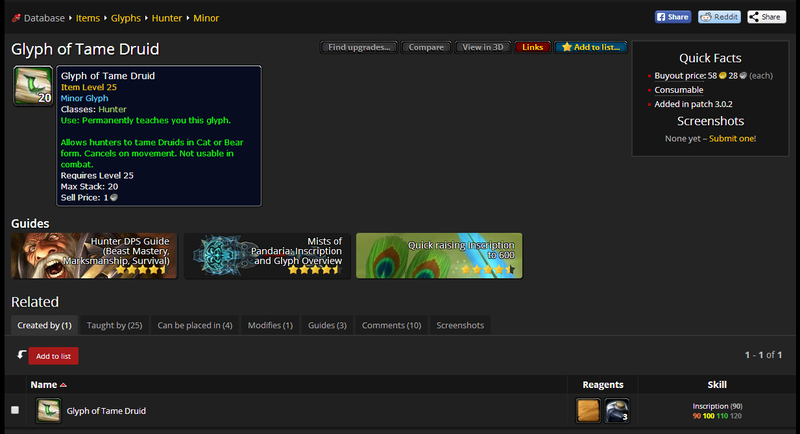 I always prided the site on being more than patch notes and rotation guides. We were a community site in every sense of the word, and it really shows when you look at everything we accomplished. So if you ever get tired of poring through the minutia of the latest patch notes or blue post, and want to, say, read some poetry about hunters getting drunk and shooting things, head on over. Or if you’d like to join our Facebook group (still active, and 860 members strong!). Or want to read Frost’s cranky rants about how things were back in vanilla, or see 25-man all-hunter raids kill current-expansion bosses, or see pictures of hunter thongs at IRL get-togethers, or…you get the idea. 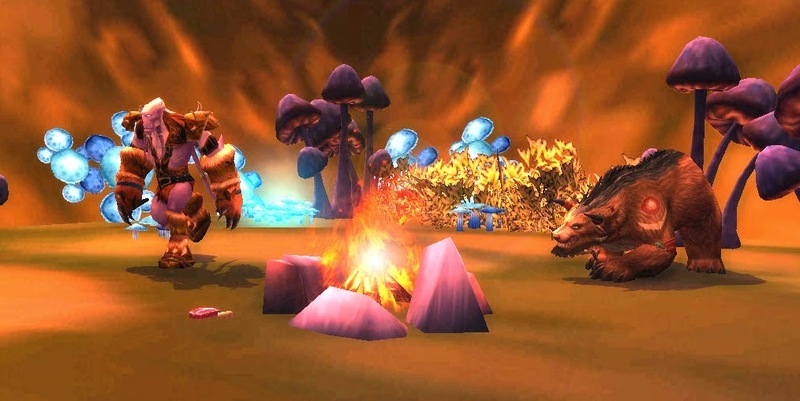 That stuff is what made WoW the transcendent experience for me that it was, and it’s what I come back to when I get nostalgic. But thanks again, and best of luck! Celestalon was on twitter today explaining how the new Black Arrow guaranteed LnL (which isn't called LnL anymore, but I don't know what else to call it) will work. It is not the case, as many had suspected, that the last tick has a higher chance to proc LnL if no others did. Instead, when you first shoot Black Arrow, it will do the rolls for all of the ticks right then, and assign them to the ticks that won the rolls. He didn't mention, but I would assume the 10sec ICD still applies. @AwfulHunter Somewhere; no guaranteed spot, just somewhere. @WayethGaidin Proc count starts at 1, then it has successive 20% chances to add 1, until it fails a roll. @CollisionTD @WayethGaidin Yep. But you don't need to know any of that in order to play optimally; that's just the nitty gritty. This does mean that it'll be worth knowing what tick you're on, because you'll even though there's not a greater chance of getting LnL on the last tick, you will know that if you haven't gotten it yet, you will get it. There aren't a lot of cases where you could use that to your advantage, but maybe with your second potion, every once in a while it could line up where you can take advantage of that. This is also bad news for the PvP hunters who were hoping this would mean they'd get an automatic LnL if BA was dispelled. We can still pester the devs to try to get dispel protection, but it looks like this mechanic isn't going to address that problem. PSA: We're currently in the middle of implementing many changes. Damage values that you see in data mining are not nerfs. I tend to agree, it would be silly to call any of these changes buffs or nerfs. However, we can start thinking about how they will affect the spec. I'm sure there will be many more changes to come, but the most recent build gives us a good picture at the direction they're going at least. Aimed Shot now does 255% ranged weapon damage, down from 450%. Careful Aim now also works while Rapid Fire is active. Chimera Shot now does 190% ranged weapon Nature damage, down from 210%. Rapid Fire (New) Increases haste by 40% for 15 sec. Hunter - Marksmanship Spec. Instant. 2 min cooldown. Can you guess what's got all the hunters excited? @The_Torgall @the_solarflair @CloakAndQuiver It really does turn Careful Aim into a "cooldown", I see what @Celestalon was talking about. That's right a 75% increased chance to crit on Aimed Shots used during Rapid Fire, which also means a 75% increased chance to get the bleed from piercing shots, and 75% increased chance of getting 20 focus back at the end of aimed shot thanks to the perk Enhanced Aimed Shot. It will be very interesting to play with Fervor and with ToTH to see which ends up better. Fervor will basically give you 3 extra Aimed Shots during Rapid Fire. ToTH of course will simply reduce the cost by an additional 20 focus, if it is proc'ed (currently it's generally proc'ed around 70% of the time). Imagine having a series of Aimed Shots that guaranteed to crit and only cost 10 focus. That's most likely going to give ToTH the edge, but it's a bit of a gamble, since it may not proc the entire time you have Rapid Fire up. With Fervor you can guarantee those 3 extra Aimed Shots. As was to be expected, with all of the crazy perks Aimed Shot was getting, it's been lowered from 450% Weapon Damage, to 255% weapon damage. However, it's important to remember that Weapon Damage will be scaling substantially more with Ranged Attack Power, which means your Aimed Shot damage won't make a huge jump when you get your current tier weapon, but it also won't stagnate afterward. It should continue to improve in damage fairly linearly as you gear up. Chim Shot had a similar, but much smaller, Weapon Damage reduction. This was also to be expected, for the same reason. It won't benefit as much from a new weapon, but will scale significantly better. Another affect this will have on our rotations, is it means we'll be needing to stack Rapid Fire with our Trinket Procs. Where this tier it's been most beneficial to use Rapid Fire immediately as it comes off CD, in WoD we'll need to hold off on it until we get an Agi/AP trinket proc up. Again, because the increased AP multiplier in weapon damage, stacking the two together will be a huge increase. In addition, much like we do currently for Bestial Wrath when playing BM, you're going to want to have at least 90 focus when you start rapid fire, but not more than 110 focus (which is a pretty small window to aim for). Remember that having 100 when you hit rapid fire means you'll be up close to or above 110 before you actually shoot your first Aimed Shot, depending on how much haste you have. If you're above 110 focus when you start you'll risk losing some to capping. If you're much below 90, you may not be able to cast 3 in a row immediately, and will have to resort to steady shots sooner. Of course, as soon as we have some more numbers to look at, I'll be doing the math to see just how much differences these changes will make. I would predict that the reduction in the weapon damage multiplier for Aimed Shot will insure that Chim Shot is still our first priority, even when Rapid Fire is up. Another question we'll need to answer is do we use Rapid Fire when the target is above 80% health? Since that first 20% goes the fastest, it may be more beneficial to use it at 80% so you're not wasting the Careful Aim bonus. We'll have to wait for at least the Beta to find out. Just heard back from Celestalon regarding use of Aimed Shot vs. Chim Shot while Rapid Fire is up. Sounds like they're open to that happening. @DeliriumHunts May occur at high ilvls, but not actively a goal. We'll see how the tuning works out best. One of my goals for this blog, was to have a little bit of content for a lot of different hunters. I may occasionally go a bit overboard with the math and spreadsheets part of it, so today I want to take a minute to talk about a really basic part of your hunter UI, which is incredibly important to maximizing your DPS. There are two addons (as far as I know) which are commonly used to track important buffs, debuffs and personal mechanics: Weak Auras 2, and Tell Me When. A lot of hunters are using Tell Me When these days, but it seems like, at least in the states, Weak Auras is still over all a bit more common, so I'll use that for our examples here. Earlier this week, I posted about how to read logs to see how well a hunter is utilizing their trinket procs, but I didn't mention how to monitor those procs when you're in game (for more on why DoT snapshotting is important, click here, for more on stacking CDs, click here). Regardless of which addon you use, the point is to know if you're trinkets are proc'ed or not, and how long their proc has left. This is where Weak Auras or Tell Me When comes in. If you're unfamiliar with Weak Auras or addons in general, you can install it automatically using a program like Curse, just google for Weak Auras and from there you'll be able to download and install it. Once you have it, you can type "/wa" into your WoW Chat box to pull up the interface you see in the picture above. You may want to learn to create auras on your own, but for now you can just import this very simple weak aura string that I put together. Click the Import button at the bottom of the gui, and then copy and paste the string at this link. When you paste it, a little window will pop up saying the name of it; if you hit the import button it will load it. What you now have are some little icons that will pop up when the buff from AoC, TED or Haromm's Talisman procs, as well as when your scope procs, and I've thrown in a timer for Virmin's bite, just for good measure. You can move these to anywhere on your screen by just clicking and dragging them, or you can change the size using the display tab, clicking on individual auras, but that's all you'll need to adjust. Fairly painless, right? There's one other addon that's going to give you a lot of help in utilizing your trinket procs, Needtoknow. You can actually achieve this same function using WeakAuras, but it's much more complicated to set up, and we don't want to bother when there's already a great addon like NeedtoKnow. NeedtoKnow is basically just some bars that will go on the side of your screen, somewhere out of the way, but where you can track the cooldown of your ICD trinkets. In 5.4 Assurance of Consequence is the only ICD trinket we've got, but it's a huge, 20 second buff, so it's worth knowing when it will be available again. The reason you want a timer for ICDs when available, is you'll need to save your major DPS Cooldowns, like stampede, or Rapid Fire for Marksman hunters, for when you have procs up. I generally can get off a Stampede on every other AoC proc, and a Murder of Crows often on every proc. However, if your stampede or aMoC comes off cooldown while your fight is getting close to the end, you can look at how much time is left on the timer. If you're not going to get another AoC proc, you can go ahead and use everything you've got to get through that last bit of the boss faster. This should be enough to get you started monitoring your procs, and help you take advantage of them. 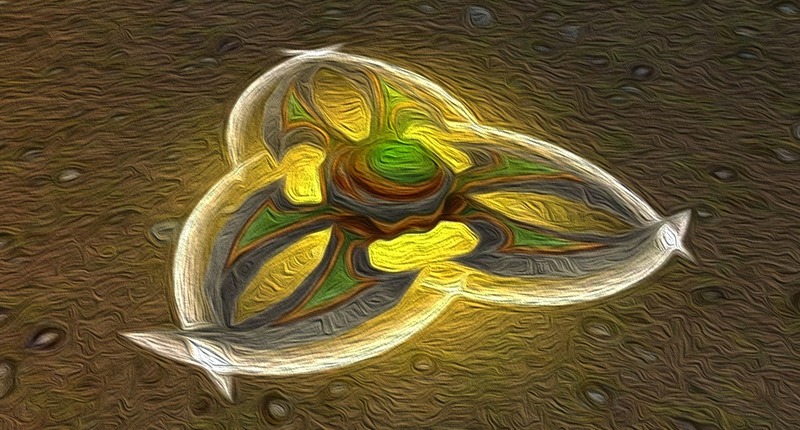 There are several other things you may want to monitor with Weak Auras or Tell Me When. I have giant dummy lights set up to give me warnings if my Serpent Sting, Black Arrow, or Steady Focus fall off. I also have smaller, less blaring timers set up to tell me things like how long I have left on SS, BA or SF, as well as tracking all of my DPS cooldowns. 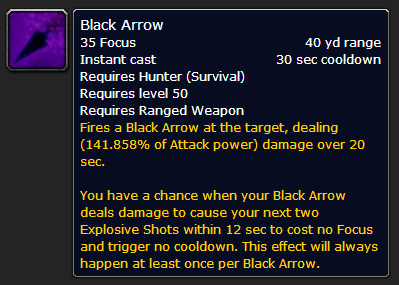 And finally, I use it for boss specific mechanics, like monitoring your shield on Malkorok and Shamans. We'll have to get into that another time. If you'd like any of the strings I use for those, feel free to email me, Delirium . 1500 @ Gmail.com, and I'd be happy to share anything, or offer any UI guidance I can. This week's Thursday throwback comes from back when ICC was current, and Arth of the WHU managed to successfully Pet Tank Sindragosa. For more on how he did it, check out the article here. This week's TBT also comes with some great news, in that the Thrill of the Wild is going to be featuring an interview with a long time dues payer, one of the most famous Pet Tankers in World of Warcraft. 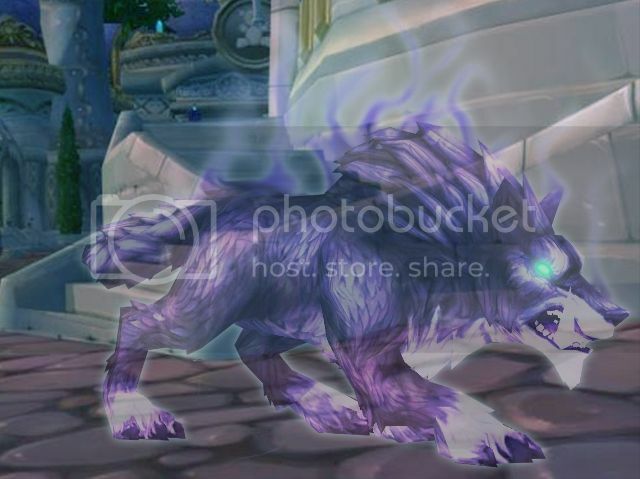 SpiritBinder over at Petopia created this potential in game image of the recently Datamined Wolf Pets. 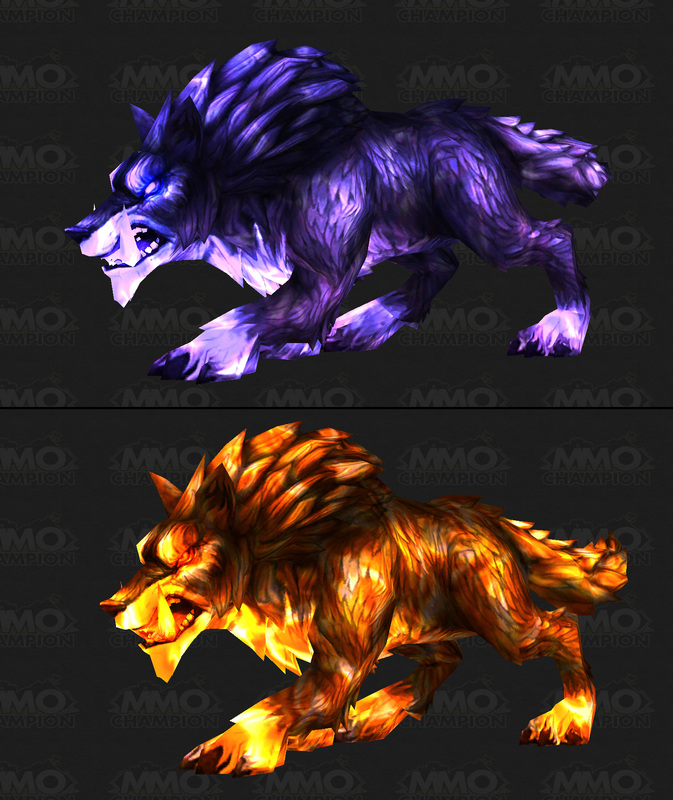 These may be spirit beasts, or may be other challenge tames, but they're in the new alpha build and are insanely awesome. Not sure why, but wolves have always been a favorite of mine. 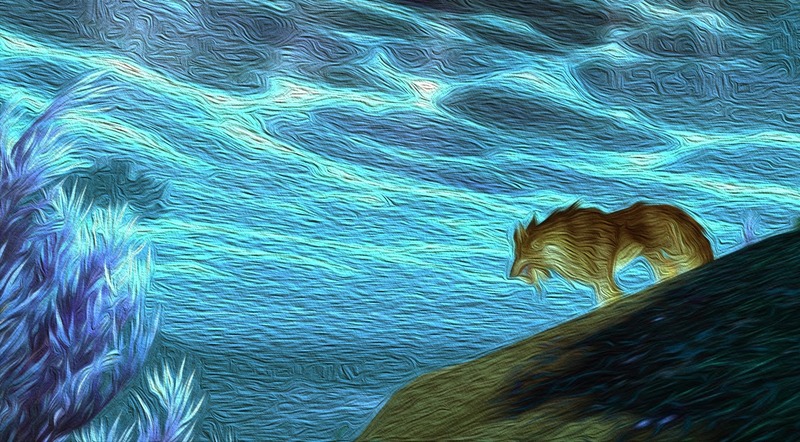 The Skoll looks a bit clunky, Karoma is one of my favorite spirit beasts. And several of the normal, common wolves just look awesome. Deathmaw is my pet of choice when playing SV or MM and my raid team doesn't need any buffs from me. All that to say, these two are going to be amazing. I do think she's undervaluing haste plateaus, for Stampede and for Dire Beast (which she didn't even mention); however, in practice I tend to agree with her analysis. Especially if you're reforging for Haste>Mastery>Crit, there's no point where you'll want to stop reforging to haste, since the pet attacks, meta gem, cloak procs etc will scale linearly. As we get more logs with the new upgrades, I'll try to double check that this is playing as we're predicting. I'm glad to see she's putting up these quick little videos, in between the large guides. Great addition to the hunter community! 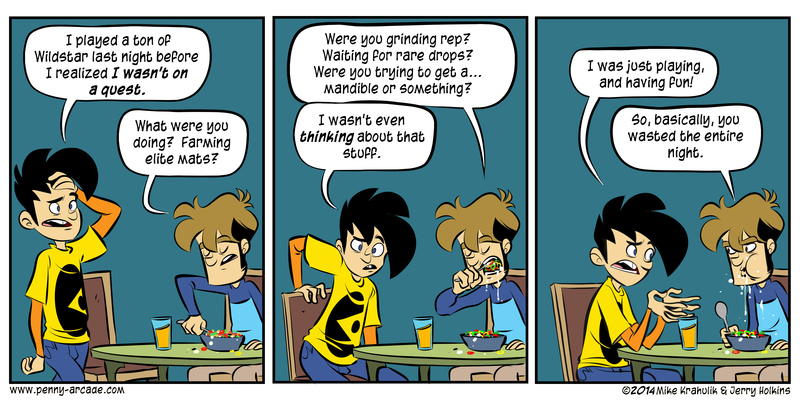 I'm not generally a penny-arcade fan, but this one was pretty great. And it turned into some really interesting conversations on twitter. I'd go even further and state that many players would rather be perceived as unskilled than unknowledgeable or inefficient. Because think about it: you often get more grief for picking the "wrong" champion or MMO gear choice than you do for you actual performance. This is something that I notice over on the hunter forums a lot. Someone will come looking for help with their DPS, and the responses will primarily be things like you should use this trinket instead of that trinket or use this build instead of that build. To put this as plainly as possible: the total DPS gained by switching from orange Agi+Crit gems to Agi+Haste gems is nothing in comparison to doing your rotation well. I'm not saying we shouldn't optimize our gems and our reforging, that sort of advice is fine, but the difference it will make is incredibly minuscule. Playing well should be about playing well, though. With whatever gear you have, there's a max DPS you can do, and every hunter (except this tier SV hunters) will do X% of that total possible DPS. That's the number we should be focusing on improving. A lot of the hunters who come looking for help will say things like "I matched my gems and reforged to Ask Mr. Robot, so why am I not doing more DPS?" If your response to them is "well actually you need to put in custom stat weights to use Ask Mr. Robot", then they will go away playing absolutely no better than they were before. Remember just a few months ago when BM hunters were still going Crit>Haste>Mastery? They nerfed haste's effect on RPPM trinkets so we all went back to the old Crit>Haste>Mastery build. And then some great hunters were willing to play around with the stat priorities, and found you can actually do a little more with a Haste>Mastery>Crit build. What we thought was the most valuable stat was actually the least! And that is going to continue to happen unless Blizzard completely changes their design philosophy. We'll need to keep changing what we use as BiS gear, and what our stat priorities are. To me, that makes focusing on playing well instead of gearing well even more important. You can't always control what gear you have, or what stats you have the most of. You can always control how well you play, though. 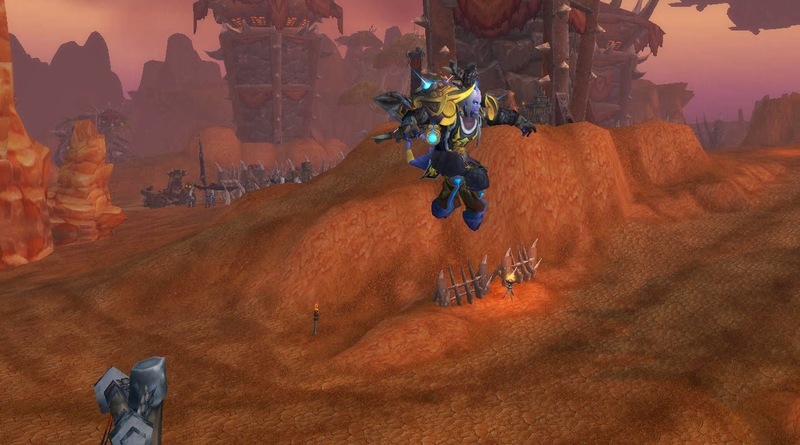 "We’ve recently identified an issue that was causing the Rated Battleground flag carrier debuff to function incorrectly. Under normal circumstances, non-tank flag carriers in Warsong Gulch and Twin Peaks should take 20% additional damage, and tank-specced flag carriers should take 50% additional damage. Currently, that debuff is only increasing damage to tank-specced players by 20%. We’re in the process of applying a hotfix that will, once again, cause tank-specced players to take 50% increased damage when carrying the flag. This hotfix will be applied as soon as possible, and will not require realm restarts to activate. In addition, we’re working on expanding that functionality to orb carriers in Rated Temple of Kotmogu, and cart carriers in Rated Deepwind Gorge. In Temple of Kotmogu, we’ll be increasing the extra damage taken while carrying the orb to 50% if the player has chosen a tank specialization. In Deepwind Gorge, we’ll be applying the same debuff used in Warsong Gulch and Twin Peaks. Cart carriers who have chosen a DPS or healing specialization will take 20% increased damage, while cart carriers who have chosen a tank specialization will take 50% increased damage. These changes will not be applied until next week’s realm maintenance. These mechanics and changes are exclusive to Rated Battlegrounds. They will not be applied to non-Rated BGs." So glad to hear they're fixing this. There are few things more frustrating than the last 20% of a tank's health when you're trying to get your flag back. And I'm super glad to see anything that encourages more fighting and less turtling in any PvP situation. To be honest, I didn't actually know that this mechanic was broken, but it really explains a lot. This should go a long way in making our kill shot actually act like an execute, too, if people still bring tanks into RBGs. Hopefully they'll add a mechanic like to the flag-carrier in Eye of the Storm as well, where a guardian druid can take the flag out of play for an entire game. @zaken17 That's the challenge and skill-check involved in doing well at AoE with Marksmanship. Sounds like they won't be changing the AoE mechanics for MM anytime soon. 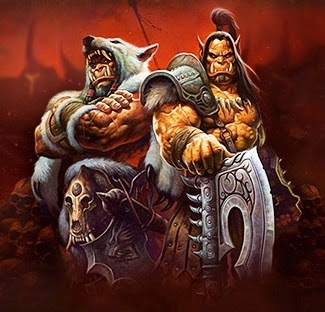 Though I realize they haven't done any major DPS balancing for Warlords of Draenor, it is so far looking like MM will be the top DPS spec for hunters early in the xpac. Currently MM can put up pretty decent numbers in single target encounters, but is relatively gimped when it comes to the AoE fights. It'll be interesting to see how it does with AoE fights come WoD, or if we'll need to switch to SV or BM to be viable. From what we know so far, the Multi-shot will be getting a slight buff anyhow, especially for MM, as they make changes to how AP scales weapon damage modifiers. It's hard to guess how they'll be compensating BM and MM for the loss of Serpent Sting damage, but it's fairly safe to assume they will be doing something, which may affect MM's AoE as well. Ladies and Gentlemen! Quivers are returning! In case you're worried, these will be fully cosmetic quivers. From the article, it sounds like they'll be optional, but for all of the hunters tired of reaching over their shoulder and pulling an arrow out of thin air, this should be a great addition. Check out the full artcraft article here. It's a fine introduction, but they could have done a lot more with two and a half minutes. It could be that there plan is to do a class overview as well as the spec overviews, in which case they could cover this there, but it seems a bit odd that they barely mention that Hunters are a pet class. They also phrase things fairly strangely. The narrator says "if you find yourself full on focus" use arcane shot, and "[cast] cobra shot whenever you don't have enough focus to use any of your more powerful abilities." I get that they're trying to simplify things, but why not go ahead and teach things right from the start? It would have been just as fast and simple to say "If you find yourself getting close to full on focus with nothing else to spend it on, fire arcane shots" or "if you're not going to have enough focus to cast Explosive Shot or Black Arrow, cast cobra shot". Anything to indicate that you don't just wait until you're out of focus, as that's one of the largest problems with many hunters' rotations. Also, you've got to mention growl. Nothing will make people hate a hunter faster than them leaving auto-growl on, any crash course should mention "turn off growl for group content" or something to that extent. I'm quite curious if they've given up on the idea of having a "starting zone" for freshly boosted 90s. They had talked about doing something similar to the Death Knight starting zone, but for each class. I don't think I've heard anything about it since BlizzCon, though. Update: See Below. Overall, however, this is a great idea. Even the simplest of guides, most new players are not going to bother reading. And I know I would have had a much easier time levelling, way back whenever, had I considered looking at a brief youtube guide. Edit: Got a quick, brief response from Community Manager Lore on twitter. I haven't done much in the way of xmog articles, but Darkbrew's article here got me thinking about what to wear to Draenor. I thought perhaps a good "re-entering the dark portal" outfit might be the heroic flamewalker's battlegear set. So I posed next to Garry to see if I could get a good feel for how it would be in WoD. I like the shoulders a lot, but over all it's a bit to peach for Draenor, I think. For some reason when I'd looked at it on moggit I had thought it was a darker red. Perhaps it will look better with a dark tabard. For bows I haven't decided between Themios the Darkbringer or Vishanka, Jaws of the Earth. I imagine I'll keep my search going. So far I like the Prideful/Grievous set the best, but it's still nice to have finished this one. @Lolzormon All of which are on different rows, ensuring a choice on each row. There was a somewhat interesting conversation going on between several people and Celestalon on twitter this morning. This isn't really anything new, but it does somewhat clarify Blizzard's position on talent "choice". Choice, to them, means there's at least one that will work for you. 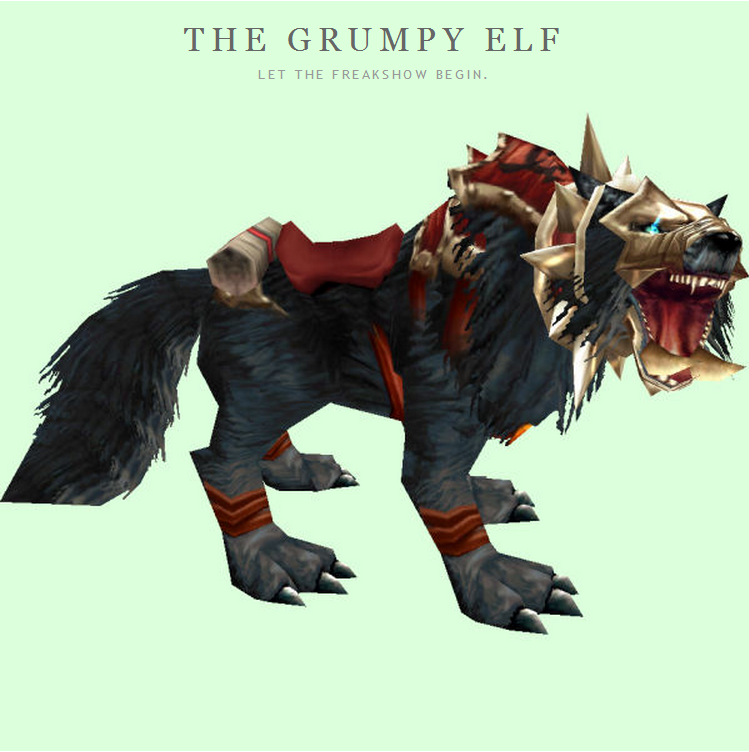 Over on the forums a lot of people seem angry that they can't have Lone Wolf and all of the utility that comes with having a pet, which doesn't make sense to me. It'd be like if a prot warrior asked for a talent which let them play without a shield, but then complained that they couldn't shield slam. I do realize that fantasy video games don't have to always be totally logical, but having master's call when you don't have a pet, or having spirit bond when there is nothing to be bonded to, these things just don't make sense to me. @Spiattalo @Nogz__ The problem is when one talent mandates another. It's OK if *occasionally* two talents are incompatible. Still a choice. @LukasIdea @Spiattalo @Nogz__ I think you may have misread. The point is that you do still have a choice, between the other two talents. What Celestalon, I think, is trying to point out, is that there's no build, no individual talent that will mean that you miss out on an entire other tier. So if you choose to not have a pet, no, Blink Strikes won't work, but you'll still have a choice in a Murder of Crows. @LukasIdea @Spiattalo That's... not actually true, you realize? It doesn't matter if a row is stronger for one spec; row is still balanced. This came out of the same chain of tweets. I get what Celestalon is trying to say; BM isn't the only hunter spec that has a pet. All of them are designed around using pets. So long as the total damage output is close, then it doesn't matter if all three tier 75 talents are better for BM than any of them are for Survival. Where he somewhat loses me is in that there is significant disparity between the three specs. Having a tier which is clearly stronger for the spec that is already doing the largest numbers doesn't seem like the best idea. In theory, however, I don't have any problem with entire tiers being better for certain specs. BM has been a terrible spec for a long time, I'm glad to see them get their day in the sun. And finally, from a totally different thread where they were talking about Mage healing utility CDs, there was this hint that they're looking into putting a hunter raid-wide cooldown. @JaydenKorr As I've said, that's a problem we haven't solved yet but are going to. 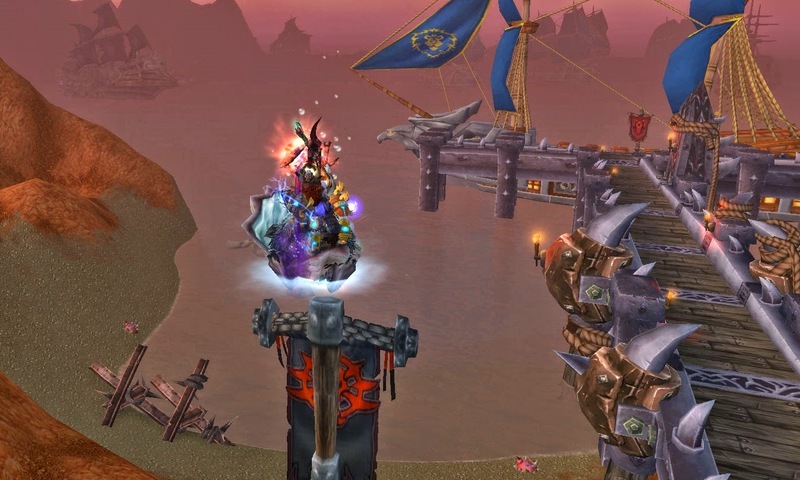 For the eight or so months that Siege of Orgrimmar has been out, I'm been attempting to make it on to the top of the banner pole just to the right as you're coming off the docks before Galakras. I must have tried getting on there a few hundred times. I thought it would be easier if I used a mount, since I'd be facing forward, but that never worked, and I'd tried Disengaging, but it's just so hard to aim disengage well, so I had never succeeded there either. In fact, before tonight, I wasn't even convinced it was possible. I thought maybe there was no defined platform at the top of the banner pole there. But then, we had 3 people not show up for raid tonight. I was really just mindlessly trying to get up there. It hadn't occurred to me that I would ever actually make it on top, and then it happened. There I was, standing atop the banner. This might seem ridiculous, but you have no idea the effect of trying so many times, and always failing! And then to finally get up there. It was as though I'd just killed Heroic Garry for the first time after several hundred attempts. Of course, now that I've figured out where to stand to disengage up there, it's incredibly easy. Still, it was a great challenge until that point. Once I got up there, a couple of rogues decided to shadowstep up to me. We then proceeded to get on our three-seater mounts, and people could jump at me then click a seat and it would pull them up into it. With this method and a couple of priest life-grips, we got all 25 of us up on the top of that damn banner. And that's how we spent the first half hour of our raid tonight! Plenty of beer, and plenty of shenanigans makes waiting to pug a few people not so terribly bad. In the vast majority of arena PvP, the winner is decided by whichever team gets the first kill. There are certainly exceptions (especially as hunters we all have great stories about 1v2ing down a double DPS team*) but in general, being able to choose a target you can kill quickly is the biggest thing you can do to improve your rating. I've been spend some time studying the various methods of choosing, and thought I'd go over them here, from the hunter perspective. This is a common mantra, and to some extent it's logical. If you hit someone, and they just get healed, then your hit wasn't worth much. From that it follows that you should kill the Healer first. This, however, can cause a lot of problems, especially for hunters. For one, if you're in an all DPS team, it leaves you open to getting wailed on while focusing their healer. And most importantly, as a hunter, your CC is dispellable by the healer, making your scatter/trap nearly useless against anyone but the healer unless you can burst them down fast enough (PHDk, perhaps) that they can't spare a single GCD for dispelling. If your goal is to turn it into a lopsided fight (either 3v2, 5v4 or 2v1) by killing one of their players first, just pick the squishiest target and unload. This often turns into simply: "Kill the Frost DK". The downside here, is if you can't keep their healer CC'ed, it won't matter, and if they have a team with much utility, it's not too hard to counter. In my experience, this works best at low rating levels, when you're with a team that doesn't know eachother too well, because it's relies more on individual work (in bursting and keeping the non-target players CC'ed) than on teamwork. This is the one that makes the most logical sense to me. If you take out their most powerful player, then you don't have to worry about getting yourself killed. See that warrior? He wants to smash your face. I don't want to have my face smashed. So I'll smash his face, instead. This seems especially applicable to really bursty classes. If they're having to use their defensive CDs it means they aren't bursting on you. And often if you can ruin their burst, they'll be off enough for the rest of the fight that you can get the kill. I think everyone in the world will agree with me that warlocks and magi are the most annoying classes ever. Not that they're particularly OP for PvP, but they're definitely annoying. So why not take them out first? Unlike hunter CC, a mage can spam Polymorph until DR has turned it to nothing. If you let them set up and free cast, they'll keep on of your players completely occupied, by doing a crazy amount of burst. If, on the other hand, you can keep them on the run from the start, they're likely to never have a chance to get a good burst/CC chain going. At the beginning of the fight, a lot of what determines who you can hit is who's visible. If the other team's druid is prowling, hit something that's visible. As the fight goes on this turns into thinking about line of sight issues as well. If someone just ran around a pillar and LoS'ed their healer, it might be time to hit them with some roots and snares to get them down before while they're healer can't get to them. As hunters this one isn't going to be as important to us. For one, our heightened senses allow us to see most enemies who are stealthed. When going against a druid or a cloaked rogue team, it can be worth it to take glyph of camo and spend some time looking for your target, then getting a flare on them to start off. The positioning issue, on the other hand, is huge for us. With good use of disengage, or glyphing our ice trap, we can move around pretty quick to get in some hits while their healer is LoS'ed. Of course there isn't one single best way to choose who you target first. It'll depend a lot on the other players on your team, and the comp you're up against. As a hunter, targeting the burstiest opponent, or the opponent with the best CC seems to work the best for me. If I can help it, I never want to target a healer because I don't want the healer dispelling my CC, and overall hunters are just much more effective at ruining bursts or CC chains. However, with certain comps, focusing a healer, even at the cost of your CC, might be the better option. 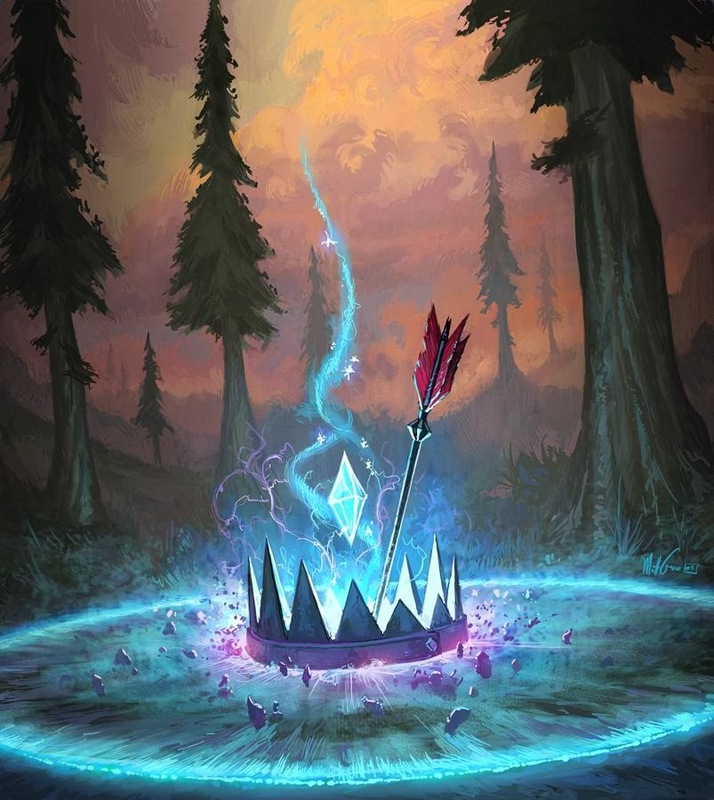 One logical trap a lot of people have problems with is after, for example, training that mage for a while and watching them never die, you notice that just 2 shots to the priest's face brought them down to 50% health. So then we think to ourselves, "oh, I should have focused the priest". When in reality, had you focused the priest it would have been healing and building a shield on itself instead of that pesky mage. While I do always like to think about any fights I lose (or win) and try to analyze where I could have done better, I can't really know what would have happened had I tried something else; could be we would have lost even worse. And that's just something we all have to deal with. I'm curious if anyone has other qualifications they use to decide who to target? Ever target the guy with the most annoying name? Or how about always killing the elf first; because then even if you lose, you still got to kill an elf? *oh man, I remember this one time I was running 2s with a resto druid friend against a Rogue/Frost DK team, and they managed to get down my healer, somehow. So I focused on keeping the rogue trapped while kiting down the DK, finally get the kill on the DK while I'm still above 50% health, then the rogue and I start going at it, and we both have just enough heals, and just enough skill that it goes on for several minutes, on trading blows and CC. Finally, we're both down below 25% and I get an Aimed Shot proc right as my Chim shot comes off CD, but then he vanishes, and all the sudden I'm stunned and the rogue starts unloading on me! So I trinket, disengage (webbing him), my health is dropping with the bleeds he got up, so I race to hit my free Aimed Shot, Chim shot, Kill Shot, Kill Shot and as he's sprinting toward me, unable to vanish again, I finish him off with an Arcane to the face, my health just above 1%. @AwfulHunter No, Master Marksman stays, and does interact with Focusing Shot. Celestalon re-confirms Master Marksman ability is to remain the same in Warlords of Draenor and will work with Focusing Shot. No word yet (that I've heard, at least) if the proc rate will change due to the lower use of focusing shot. Especially in PvP, the free Aimed Shot can sometimes be the push you need to get a kill, while the added cast time and movement requirement for Focusing Shot will make LoSing much easier. I'll be very interested to see how the top PvPers use this talent, or if they do. Over at the Eyes of the Beast, there's a pretty interesting conversation going on in the comments of his article about some tweets with a little more info regarding Lone Wolf. And overall, there's just been a lot of buzz about the Lone Wolf talent for MM and SV hunters at level 100 in WoD. It seems many people who choose to play hunter saw themselves more as "rangers" than hunters; these are the people who saw the Night Elf Sentinels and thought a hunter was close enough. Though I can see how it could be fun to occasionally not have to worry about my pet in strange boss fights, for the most part, I'm a big fan of the pet interactions. It is incredibly frustrating when on Garrosh, you've got Stampede up, and they waste half there time running back and forth between Garrosh and the Weapon that you had only wanted to throw some DoTs on, or you get back from one of the transition phases and they just don't attack at all. In this, and many other buggy situations, being able to opt for no pet would be at least convenient. This is something I don't imagine will be a problem for top-end raiders. 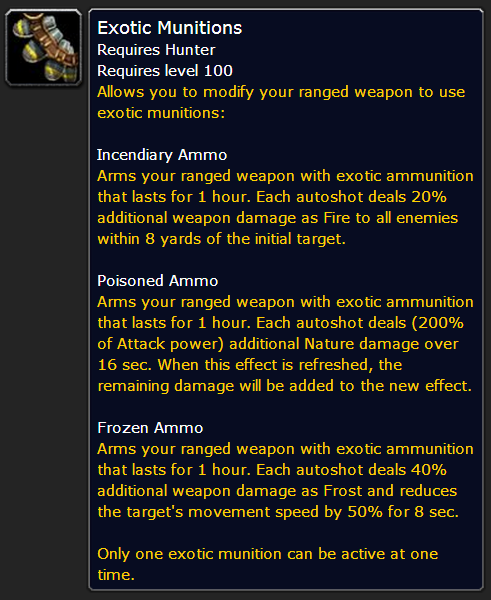 But there's a skill cap that is going to be involved with Lone Wolf that I worry a lot of hunters aren't considering. Currently, the way hunters work, we have two ways of gaining DPS that are basically completely free DPS. We have autoshot, which is similar to what all melee have (or casters with wands). And we also have pet damage. I realize that I was just a couple paragraphs complaining about my pets not always being on the boss, and losing some of that damage; however, for the most part our pets are free damage, that we don't really have to think about at all, just set on the boss and let them do their thing. Let's say your maximum possible SimC DPS is 375k dps throughout a single target fight. A pretty good, normal-with-some-heroics type raider will do about 80% of their sim damage, which puts us at 300k DPS in a real fight. Of that 300k dps, 56k (~15% of 375k) was pet damage and 31k was Autoshot Damage. That means your rotation acounted for 213k. If we take pet damage and autoshot damage out of your simmed dps, the total possible that your rotation could have done is 288k. Even though your total dps was doing 80% of your simmed dps, in actuality you were accounting for about 74% of your simmed total. Since the free pet and autoshot damage inflate how much you do, and how much is possible, it makes it seem like we're doing our rotation better than we actually are. So let's look at that without pet damage. We now add 30% more damage to all our shots (including auto) but we lose the pet damage. Most would assume that would at up to a net gain of 15% more DPS. But because pet damage was inflating our DPS and our rotation will now be accounting for a larger percentage of our DPS, the 30% increase only brings our total dps up to 317.2k. That's only a 5.7% increase, not the 15% increase we were expecting. And that's if you're doing 80% of your simmed DPS. As any of us who have been in LFR know, a lot of people are doing much much much less than that. If we adjust the numbers to someone who is, for example, doing 65% of their simmed DPS, then subtracting their pet DPS and adding 30% to everything else, will end them up at the exact same place they were before. If you can perform your rotation close to perfect, this will create a significant DPS increase of 15%. Without a perfect rotation, however, it becomes less and less valuable. Until, as I mentioned, for someone who can only do 65% of their simmed DPS, Lone Wolf provides no gain at all.